Brinjal /Egg plant undoubtedly is the king of all vegetables , and my hubby loves this dish because of its strong aroma and taste. There are a number of curry powder flavors (depending upon which region you belong to) that goes well with egg plants , here I would like to share one of them (Will surely share the other stuff prep in the upcoming posts ). Step 1:Dry roast coconut flakes and sesame seeds separately until they turn golden brown color . Now dry roast all the spices taken until they give out aroma . Let them cool. Step 2: Now add the roasted ingredients to a blender and make into a coarse powder or fine powder. Now add garlic cloves and salt for taste , turmeric powder and give some pulses such that garlic mashes up (not into a paste ). Step 3: Wash the eggplants thoroughly, &slit them lengthwise on four sides. Step 4: Take a skillet add a table spoon of oil add the slitted egg plants and fry until they become tender . Sprinkle a dash of salt for even frying. They look more like this after frying . Step 5 : Now let them cool for a minute & stuff them with the curry powder . Step 6: Now take another skillet add oil and when it hot enough and not smoking , simmer the flame and add the stuffed eggplants . Cook them in low flame for about 10 to 15 minutes or until the stuff changes its color or fried . 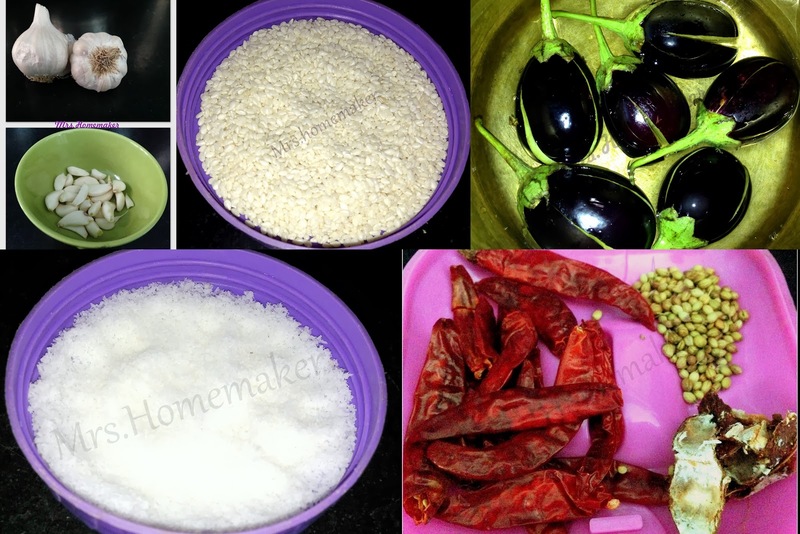 Serve hot with white rice . You can check the freshness of your brinjal by its weight ,the lighter the brinjal the fresh it is. Brinjals turn brown very quickly after slitting , place them in water and add a pinch of salt to stop them turning into brown color . You can cover while frying the egg plants which helps to tenderize them quickly . You can even deep fry the brinjals rather than sauteing them , either of them gives out same taste . Delicious stuffed eggplant love to have with my rice.